This is a natural breed, which existed in isolation for a long period (at least 100-150 years) on a chain of islands collectively known as the Kurils, which belong to Russia and Japan. In Russia there are several documents referring to cats with a short tail, which were brought home from the islands by the members of the military or scientists in the middle of the 20th century. The character of these cats made them very popular even without being promoted as a pedigreed cat. Many people brought these cats home from the islands, but historically in Russia there were no cat clubs and therefore no breed standards to guide those who raised them. In its natural wild habitat, this cat is known to be both an excellent swimmer and fisherman and an exceptional rat hunter. It is said to be no problem for this cat to catch a 5 kg fish or a hare in the wild. People who live in Kunashir report that bear will run away from this cat! However, this breed is not well known out of its native territories and the western regions of Russia. It is still discovered in the wild on a chain of islands known as the Kurils, which run from the easternmost point of Russia to the tip of Japan's Hokkaido Island. The population is small and it is considered a very rare breed of cat. Part of the reason for its rarity is that there are just 2 or 3 kittens in a litter and it breeds only once per year in the wild. At the first cat fancy exhibitions of the Kurilian Bobtail (1990) many foreign experts were concerned that these Russian cats with a short tail were just a Japanese Bobtail of a heavier type. Even today, it cannot be said that the Kurilian Bobtail and the Japanese Bobtail have an entirely different genetics. In fact, it is probable that the Kurilian bobtail was the original source of mutation for the short tail in the Japanese. Yet, the difference is that the Japanese Bobtail is a created breed with a similar tail. Russia has not enough Japanese Bobtail for the realization of research into a comparison of the genetic makeup of these breeds. However, the Kurilian are cats of the wild type with a wild origin. Russian Breeders have kept this distinction in the Kurilian, while the Americans have created the elegant Japanese Bobtail.In contrast, the genetics of the Manx is entirely different from the genetics of the Kurilian. It is also important to mention that these genes do not give any other side effects or any health problems that can occur in other breeds with short tails, such as Manx. These complex genes are isolated to only the tail. These cats has existed in their natural environment and interbreed without intervention from man for centuries. Approved in novice class 2004 by FiFe and 2012 by TICA. 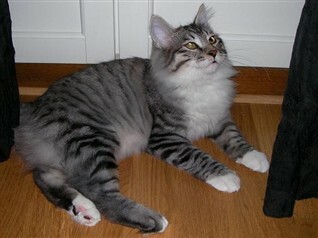 Kurilian Bobtail are strong cats, with a wild appearance, large. They have excellent health and a very well-balanced character. They love to be caressed and are very gentle. In the wild this cat runs in packs, similar to the wolves. It is also highly intelligent. It has a great love for both human company and other species of pets, trust its enviroment and it is perfectly happy living in an apartment in the city. This ia a quiet cat, who sometimes like to chat. It has a low, almost chirping sound. Kurilean Bobtail has excellent balance and has compensated for their short tail, with strong muscular legs. Many Kurilean Bobtail likes water, but there is a difference in swimming ... and be bathed ;-). HISTORY: breed is created on the base of aboriginal short-tailed cats occur on the Kuril Islands. Breeding program began in 1992. GENERAL: large or medium sized muscled animals. Compact powerful body with short, pompom shaped tail. HEAD: large, in shape of trapezium, rounded in contours, wide at the cheekbone level. A gentle dip from the forehead to the broad, medium long, straight nose, without definite stop Well-developed wide chin. A bit rounded in profile. EYES: Shape: walnut, oval on top and round on bottom. Placement: set on slight angle between base of ear and tip of nose one eye width apart. Color: clear, brilliant, no relation to coat color, white cats, vans and harlequins can has blue or odd eyes. EARS: medium sized, wide at the base, slightly slope forward. Set wide apart аnd medium high. Distance among the ears is equal to ear size. Ears are rounded at the tips. BODY: compact, muscled, well-boned. Back shows delicate arch-like line from the shoulders to the higher rump. Legs medium in length, strong, sturdy, with rounded paws. Hind legs are longer than front. TAIL: Composed of one or more kinks or curves or any combination thereof. May be rigid or flexible. The direction of tail is not important. Visible length of the tail from 3 to 8 cm. Size and shape of the tail should harmonize with the common appearance of the cat. COAT & COLOR: Longhair Division: Texture: fine, silky, laying flat. Undercoat: minimal. Coat length: semi-long. Tail coat: full and plumed. Color: all colors accepted as listed. Shorthair Division: Texture: soft, silky, laying flat, resilient without a plush dense feel. Undercoat: minimal. Coat length: short. Tail coat: same length as body coat. Color: all colors accepted as listed. COLOR: all with the exception of color points, chocolate, cinnamon, fawn, lilac and the same combined with white. PENALIZE: Tail length from 8 to 12 cm or less than 3cm. One-vertebrate tail. Delayed bobtail effect. Extreme arch-like back disharmonizing appearance of the cat. Slender type. Type likes the Japanese or Thai bobtail. DISQUALIFY: Absence of the tail bone. Deformations of the spinal vertebrae. Short straight tail without kinks and curves. Tail longer than 12 cm. Outcross with other breeds are forbidden. Form of tail consists of 5-15 vertebrae. The length usually runs up to 5-13 cm or 2/3 of normal tail length. The vertebrae curve at obtuse angle. They may keep partial flexibility in some junctions of the tail. The vertebrae may form one or two strongly pronounced kinks. Such type of “whisk” will look like zigzag. The tail of semi-longhairs is usually bushy and proportionates to the body. But the same tail of shorthairs may look somewhat absurdly. This form of tail mostly consists of 2-8 vertebrae, strongly deformed as if they stick between them. The vertebrae joint rigidly. The kinks are felt like knobs. The short-cut “snag” usually consists of 2-3 still and rigid vertebrae. The presence of a skin pouch on such a tail may testify that the laying of vertebrae was meant for bigger length. But for some reason, the vertebrae resorbed or simply deformed in the process of embryogeny. The vertebrae of such a tail may coil up, but it is impossible to determine the direction of cockling due to very close fitting. Sometimes, such a “snag” ends with 1-2 vertebrae, thin enough and pointed aside. As is often the case, the vertebrae of so-called “snag with outgrowth” keep partial flexibility. This type of tail is the most beautiful and preferable. This tail consists of 5-10 vertebrae deformed in the manner that they form sharp angles in their junctions. These sharp angles permit the tail to coil up. The “spiral” may look like a halfbagel or fishhook. The vertebrae junctions can be articulated or semi-rigid. It can also represent the combination of articulated and rigid sections. In this case the cat is able to wag with one or several sections of its tail. Such tails may be long enough if the vertebrae are not so deformed. At the same time, semi-longhairs camouflage the tail length with hair. The shorthairs having spiral tail look very amusingly, if the tail size is in good proportion to the body. The knitting of the spiral or fishhook-shaped tail base with or their close laying along sacrum is also possible. Then, it is difficult to measure real length of the tail. It is true especially for short spiral tail. This form of tail commences as normal one. In other words it is straight and free from defects for the space of 5-7 vertabrae, but iy ends with a hook consisting of some other deformed vertebrae of different degree of articulation. At bottom of fact, the hook represents a spiral och a zigzag. The alternation of curved and straight section makes odd combinations. It ts especially typical for the first descendants of female cats with normal tail. With this tail the cat can not take any titles at exhibition, but can be used for breeding.